Reports of ghosts from the George W. Bush administration sighted within the Canadian federal government. 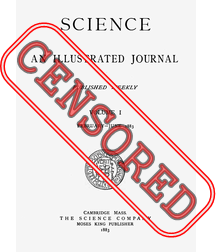 Accusations swirl around their lobbying of government officials to censor public-funded scientific research. CBC News – Canadian government scientists are still being hampered from talking to the media about their taxpayer-funded research and that’s bad news for the public, say groups representing both journalists and federal scientists. The groups appealed to delegates at an international meeting of scientists in Vancouver on Friday, arguing that democracy depends on citizens having access to research so they can make informed decisions about government policy.